Move over mashed potatoes, parsnips are here. Some people are really scared to try different things; especially something like parsnips. Parsnips are in the carrot family. They have a sweet mild taste to them. I went ahead and roasted them with some garlic and shallots, but I wanted to do more with them. So I placed them in my food processor and blended them with some heavy cream. They were so delicious my mouth is water just thinking about them. You can enjoy the puree alone or with a side of protein of your choice, here I placed it with a side of pork chops. I hope you give it a try especially since Thanksgiving is right around the corner. Enjoy! I love parsnips – especially in creamy form. Nice! 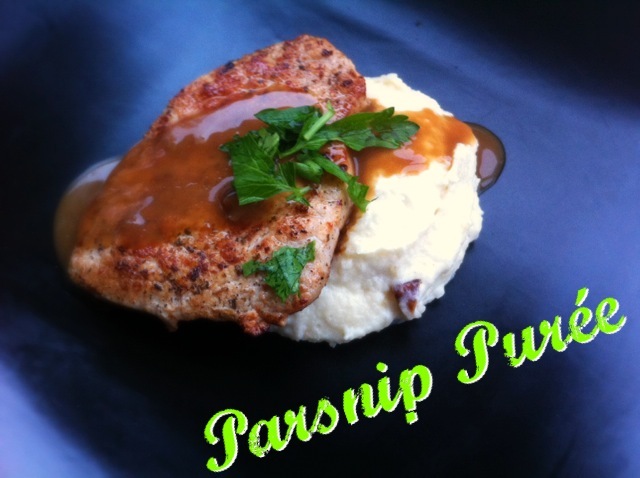 Awesome recipe for parsnips- I usually only roast them as part of a root vegetable melange. Are parsnips not eaten much in the US? There’s a n grandmotherly phrase in the UK that I love: ‘Fine butter no parsnips!’.